Transform any standard shipping pallet into a pallet box or shipping crate of any height in seconds with PALLET COLLARS (pallet surrounds) - probably the most versatile product in the market for your packaging/ crating/ storage/ internal logistics/ product transportation needs. They are designed to fit over standard size shipping pallets (48"x40", 1200x1000, 1200x800, 1165x1165) and can be stacked as high as needed without any tools. It is a cost effective, standardized, yet flexible, modular returnable transport packaging system virtually for any industry from fresh produce growers to automotive components suppliers. One product - multiple applications! * Pallet Collars have high collapsibility ratio (8:1) and provide extremely efficient space utilisation when transporting empty packaging. Perfect for reverse logistics. * They are lightweight and easy to handle; 1200x1000 (~48x40") pallet collar weighs only 9 kg (20lbs); made of planed solid timber 195x20 mm (7.7x0.8") boards and galvanized steel hinges. * Strong, durable construction - the 4 hinges lock onto a pallet firmly. * Pallet Collars are versatile. 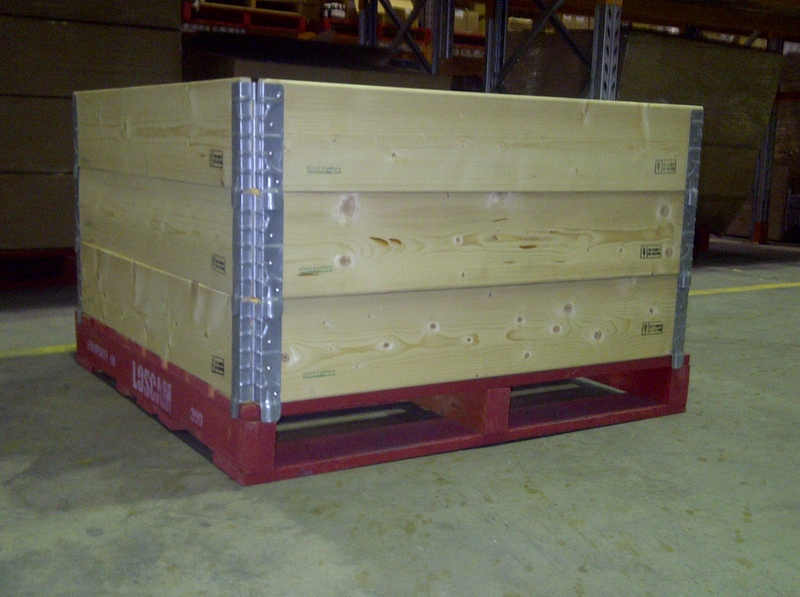 Build a pallet box or shipping crate of any height you need in seconds! Such pallet boxes can further be easily stacked on one other, thus saving on storage and transport costs - utilize every m2 to the maximum! * Environmentally friendly packaging. The collars are made of chemical-free Scandinavian spruce which comes from sustainably managed forests. * They prevent damage and/or spillage of goods/ produce. * They have high second-hand value. 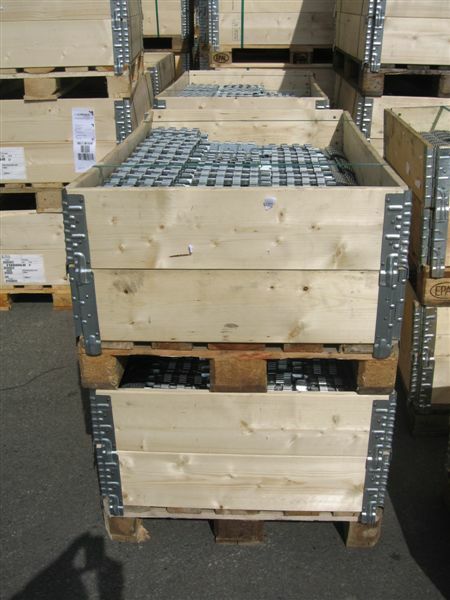 For the receiver of such packaging, pallet collars are not a cost (disposal, recycling, etc. ), but a resource. It is a preferred export packaging if you ship to Europe. Use this low cost, standardized, yet highly flexible modular transport packaging system throughout your whole supply chain from transporting the raw materials, Work in Progress, to in-house inventory handling and shipments to your customers. It will translate into lower packaging, transport and operation costs, less damaged goods and better care for the environment.